Our annual holiday concert is always guaranteed to get our audiences in the spirit of the season and this year we’re giving you A Million Reasons to Believe! From traditional favorites with pop influences to our very own interpretation of what really happened that night in Bethlehem, we will leave you inspired, renewed and entertained! Join us and our new Artistic Director, Gerald Gurss as we give all of us A Million Reasons to Believe in the spirit of the holidays – as only TCGMC can do! December 7 & 8, 2018 at 8pm; December 9, 2018 at 2pm. 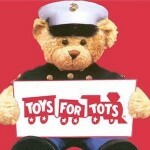 Once again this year, our concerts are a designated drop off location for Toys for Tots! Bring an unwrapped toy with you when you arrive at the concert. Representatives from the Marine Corp will be there to accept your donation in the lobby! T-Rex Cookie Co. will be setting up a pop-up store in the concert lobby for all three concert performances! Purchase one of their $5 1/2-pound cookies and 20% of the proceeds will go to the Chorus. And you can take your cookie in to the concert hall to enjoy while you watch the concert! Beer and wine are now available for purchase at our holiday concert performances on Friday, December 7 and Saturday, December 8, in addition to soft drinks, water and coffee. Coffee will be available for our Sunday matinee on December 9. And like the cookies, you can bring your beverage inside with you to enjoy with the performance. This activity is made possible in part by a grant from the Minnesota State Arts Board, through an appropriation by the Minnesota State Legislature and a grant from the National Endowment of the Arts. TCGMC is a proud member of GALA Choruses.